Ilana has performed numerous solo and chamber music engagements throughout the United States and Europe. She is assistant concertmaster of the Modesto Symphony. Highlights include solo appearances with the San Francisco Symphony and the Albany, New York Symphony, as well as appearances at the Santa Fe Chamber Music Festival, the Marlboro Music Festival in Vermont, the Aspen Music Festival, and the Tanglewood Music Center. Ms. Thomas served as the associate concertmaster of the Albany Symphony Orchestra for 7 seasons, including one as acting concertmaster. 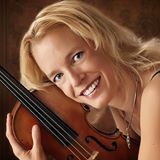 She has performed as a member of the NYC based chamber orchestra Philharmonia Virtuosi, the Springfield MA Symphony, the Modesto Symphony, and the California Symphony. Ms. Thomas’ diverse appearances have included Broadway productions in NYC, including Aida and the Producers. Among her recording credits are the Broadway Cares benefit album “Home for the Holidays” and with Broadway vocalist Lauren Kennedy in “Songs of Jason Robert Brown”. She has recorded with punk and rock bands with featured performances on electric 5-string violin and toured with Eric Clapton. Her classical recording experience has involved projects for numerous labels, including Deutsche Grammophon, Argo, and Albany Records, for film, and for the Nickelodeon cartoon, “The Backyardigans”.